PHILADELPHIA (AP) Joel Embiid went from doubtful to dominant, using a sprained right hand that nearly sidelined him to instead rock the rim, swat shots and stop the Spurs. ”I want to be out there with them. I don’t want to quit on them,” Embiid said. Ruled out by the 76ers before tipoff, Embiid made the call to push through and play, and then dealt San Antonio a rare bad hand in Philadelphia. 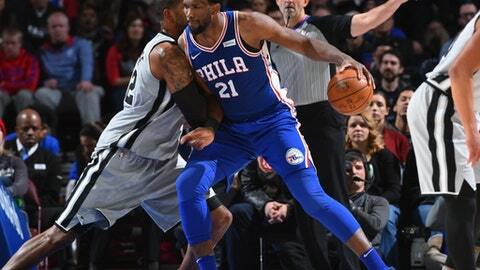 Embiid had 21 points and 11 rebounds to lead the 76ers to a 112-106 win over the Spurs on Wednesday night. The Sixers needed all 35 minutes from Embiid to knock off short-handed San Antonio and snap a 12-game losing streak to the Spurs. It was the same old Embiid during the 76ers’ fast start. He grabbed a rebound and had a putback for the first score of the game and had six points and six rebounds in the first quarter. He slammed home an alley-oop in the third and never even looked at his hand as he sank a free throw to finish the play. ”I was fine. Nothing to worry about,” Embiid said. Embiid, who blocked four shots, sat by his locker and had several minutes of treatment to try and prevent further swelling. He had an anti-inflammatory gel gently massaged into the palm of his massive hand. Embiid’s flexed his fingers before his bruised hand was wrapped in ice. ”That’s a gutsy effort,” coach Brett Brown said. Brown fleeced his good friend and former boss, Spurs coach Gregg Popovich, on the condition of his cornerstone center during their pregame chat. Popovich learned only minutes before tipoff that Embiid – and not listed center Amir Johnson – was in the lineup. Embiid suffered the injury in a hard fall Saturday against the Suns and had said before the game his hand was swollen and he couldn’t shoot. But he used a soft touch to sink a couple of jumpers during pregame drills, and that was enough to convince the Sixers he could play. The Sixers blew a 16-point lead and might have been thumped from the outset had the Spurs not sat five players. Spurs coach Gregg Popovich benched Manu Ginobili, Danny Green, Kawhi Leonard, Tony Parker and Rudy Gay with his team playing the second of back-to-back games. Ben Simmons put the Sixers ahead 106-103 on a goaltended basket and free throw. JJ Redick buried a long jumper – with an assist from Embiid – and Simmons shook the rim with a dunk that brought the fans to their feet and sealed the win. Spurs: Patty Mills led the Spurs with 26 points and LaMarcus Aldridge had 24 points and 14 rebounds. 76ers: Soccer star Carli Lloyd rang the ceremonial Liberty Bell to start the game. … Simmons had 26 points and Redick scored 20. Markelle Fultz, the No. 1 pick of the 2017 draft, appears close to playing again after missing two months with right shoulder soreness. Fultz has played in only four games this season, all as a reserve. He participated in both 4-on-4 half-court drills and light 1-on-1 work this week at practice. Fultz struggled with his mechanics when he did play, and his shooting form was widely mocked around the NBA. Brown said he had not determined how Fultz would be worked into the rotation when he did return. Brown was all smiles when he caught up with Popovich. Brown joined the Spurs as a member of their basketball operations department in 1998-99 and was a member of the Spurs organization for the first four of their championship seasons (1999, 2003, 2005 and 2007). Brown had been 0-8 vs. Popovich. Brown has a 93-272 career record in four-plus seasons with the Sixers. Spurs: Host Phoenix on Friday. 76ers: Host Detroit on Friday.